This is the list of regencies and cities of Indonesia. Both regencies and cities are second-level administrative subdivision in Indonesia, immediately below the provinces, and above the districts. They are roughly equivalent to American counties. In Indonesia, both regency and city are at the same administration level, each having their own local government and legislative body. The difference between a regency and a city lies in demography, size, and economy. Generally, a regency comprises a rural area larger than a city, but also often includes various towns. A city usually has non-agricultural economic activities. Following the implementation of decentralization beginning on 1 January 2001, regencies and city municipalities became the key administrative units responsible for providing most governmental services. The list below groups regencies and cities in Indonesia by provinces. Each regency has an administrative centre, the regency seat. 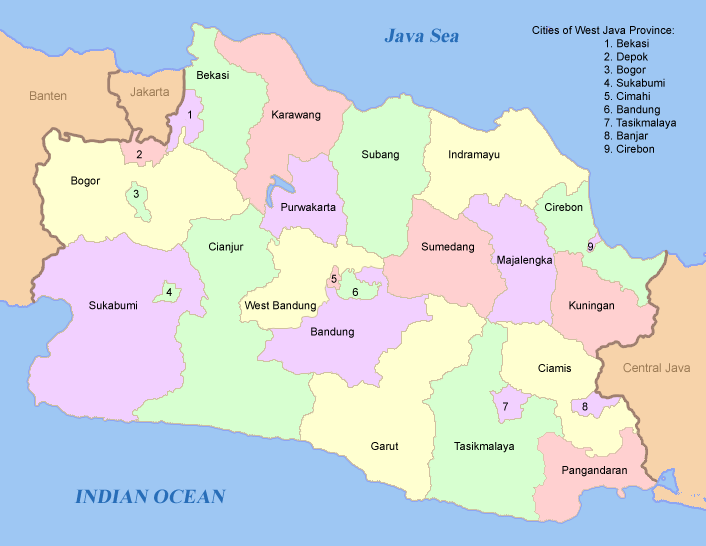 * - the 2005 population is included in the total for Bandung Regency, of which West Bandung Regency was formerly part. 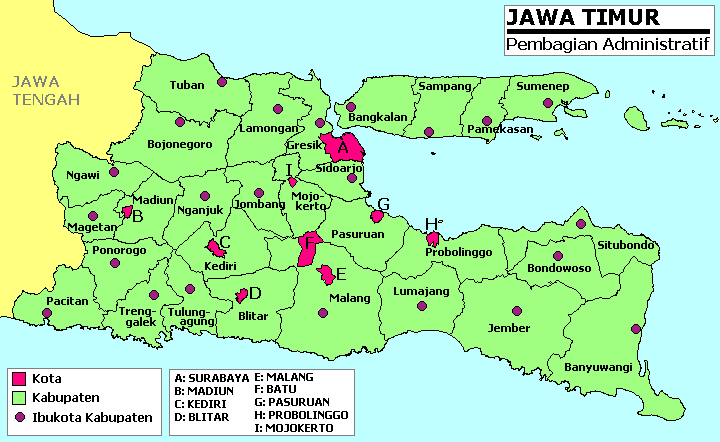 ** - the figures for Ciamis Regency include those for the new Pangandaran Regency, created in 2012. "With these new regions, it is hoped that we can shorten the line of governance, improve land and security aspects, and no less important, support historical and cultural [institutions]," House Speaker Marzuki Alie said. The agreement will be forwarded on for government approval. Marzuki said that the new regions, especially in areas bordering other nations, will be able to support more development so that border areas develop faster and become less vulnerable to the territorial claims of other countries. "We hope everything will go smoothly," he said. Under the new package, eight new provinces will join Indonesia's current 34; three of the new provinces are in Papua and West Papua. The new provinces are Pulau Sumbawa, South Papua, Central Papua, Southwest Papua, Tapanuli, Nias Islands, Kapuas Raya, Bolang Mongondow Raya, Kotawaringin Raya, Tanjungpura and North Lampung. The seventeen newly created regencies in Papua Province will comprise the regencies of Gili Menawa, Moyo, Balin Senter, Bogogha, Puncak Trikora, Muara Digul, Admi Korbay, Katengban, Okika, Northwest Yapen, East Yapen, Numfor Island, Yalimek, Mambera Hulu, Southwest Yahukimo, East Yahukimo and Gondumisisare; in addition there will be two new municipalities of Merauke and Lembah Baliem (Baliem Valley). The nine newly created regencies in West Papua will comprise the regencies of Malamoy and Maibratsau (both taken from Sorong Regency), North Raja Ampat and South Raja Ampat (both from Raja Ampat Regency), Raja Maskona (from Teluk Bintuni Regency), Okas (from Fakfak Regency), West Manokwari (from Manokwari Regency) and Imeo (from South Sorong Regency), while Manokwari will become a new independent city(from Manokwari Regency). The other new regencies will comprise: Simalungun Hataran (created from Simalungun Regency) and Pantai Barat Mandailing (from Mandailing Natal Regency) in North Sumatra, Kundur Island (from Karimun Regency) in Riau Kepulauan, Renah Indojati (from South Pesisir Regency) in West Sumatra, the Muaro Bungo municipality (from Bungo Regency) in Jambi, the Lembak Regency (from Rejang Lebong Regency) in Bengkulu and the regencies of Bigi Maria (from Lahat Regency) and Pantai Timur (from Ogan Ilir Regency) in South Sumatra. Additionally, three new regencies will be created in West Java: South Garut, or Garut Selatan (created from Garut Regency), North Sukabumi, or Sukabumi Utara (from Sukabumi Regency) and West Bogor, or Bogor Barat (from Bogor Regency). Kalimantan will see four new regencies: Sekayam Raya Regency and Tayan Regency (created from Sanggau Regency), Banua Banjak Regency and Sentarum Regency (from Kapuas Hulu Regency) in West Kalimantan, and South Berau Pesisir (from Berau Regency) and South Paser (from Paser Regency) and North Kutai Regency (from East Kutai Regency) in East Kalimantan. Sulawesi will see four as well: South Talaud, or Talaud Selatan (created from Talaud Islands Regency) in North Sulawesi, South Bone, or Bone Selatan (from Bone Regency) in South Sulawesi, and Bolio Huto, Panipi (from Gorontalo Regency) and West Gorontalo (from Pohuwato Regency) in Gorontalo; and two new municipalities: Tahuna (from Sangihe Islands Regency) and Langowan (from Minahasa Regency), both located in North Sulawesi. Other new regencies will include South Lombok (created from East Lombok Regency) on Lombok island, the regency of Adonara (from East Flores Regency) and the Municipality of Maumere (from Sikka Regency) on Flores island, and the regencies of Wasile (from East Halmahera Regency) and Obi Islands (from South Halmahera Regency) in North Maluku. Later in the same week, the House, at its last plenary meeting of 2013, approved the creation of a further seven new regencies - Mahakam Ulu (in East Kalimantan), Malaka (in East Nusa Tenggara), Central Mamuju (in West Sulawesi), Banggai Laut (in Central Sulawesi), Taliabu Island (in North Maluku), Penukal Abab Lematang Ilir (in South Sumatra) and East Kolaka (in Southeast Sulawesi). ^ Turner, Mark; Owen Podger; Maria S. Sumardjono; Wayan K. Tirthayasa (2003). Decentralisation in Indonesia: redesigning the state. Australian National University. Asia Pacific School of Economics and Government. ISBN 0-7315-3697-5. ^ "Profil Daerah (Regional profiles)". Indonesian Ministry of Interior. ^ Estimasi Penduduk Menurut Umur Tunggal Dan Jenis Kelamin Menurut Kabupaten/Kota Tahun 2014.